During the summer I like to have the boys try science experiments and other fun projects that keep them writing, reading and in the mindset of learning. This project is a lot of fun for the older elementary kids and doesn't take a lot of hands-on time for the parent. I prepped the supplies and then allowed my ten year old son, Logan, to measure, pour and read the directions on his own. Logan enjoyed the experiment and afterwards wanted to find other metal objects to clean! Have the sterling silver polishing cloth ready- parents! Write which cup you think will get the pennies clean. Leave the pennies in their cups for 5 minutes. Remove the pennies from the cups and place them on a napkin (without rinsing or drying them). Let the pennies sit for an additional 5 minutes. 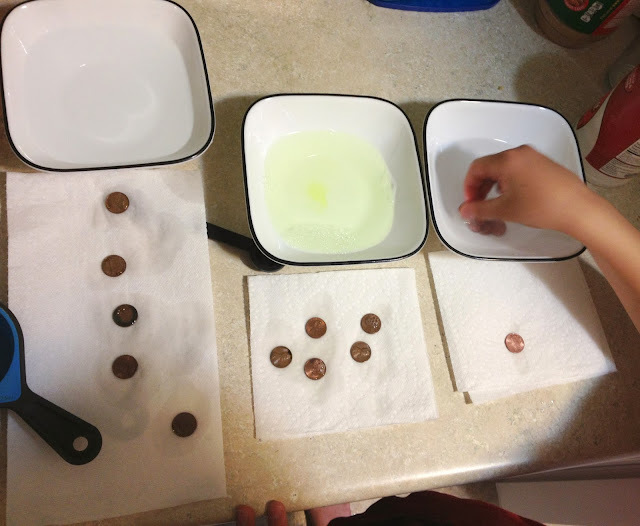 Rinse the pennies that were in the salt & vinegar cup with water. What happened?